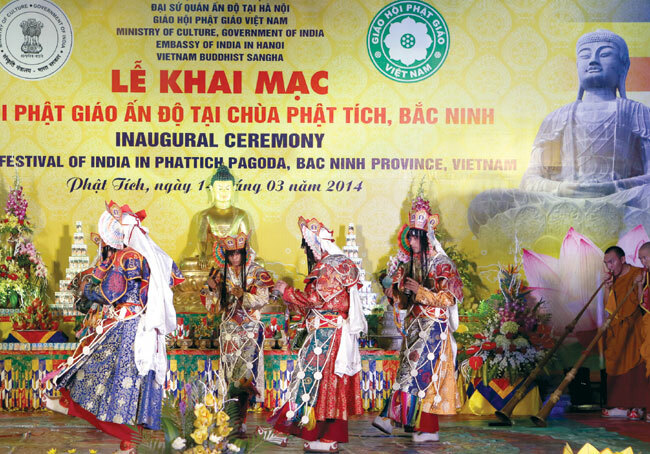 BAC NINH (VNS)— Thousands of pilgrims and visitors flocked to Phat Tich Pagoda in Bac Ninh Province last night to witness a vibrant display of India's Buddhist culture. 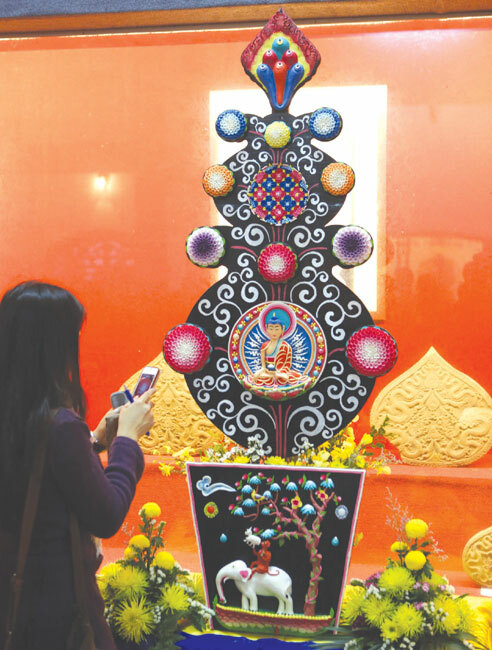 The headline event of the ten-day Festival of India, which takes place in Ha Noi, HCM City and Da Nang, the inaugural ceremony for the Buddhist Festival featured the art of making a sand Mandala and butter sculptures, along with Lama chants and dancing. Twenty Indian Lamas from the Himalayas showcased the unique art of multi-coloured Mandala, a cosmic diagram that represents the dwelling place or celestial mansion of a deity. "Sand is considered to be a superb medium because of its number and the great skill required to create the mandala's exquisite details," said monk Gelong Sange Tseving. "The artist will chant before starting the mandala creation," said Tseving. "Then the blue print of the mandala's design is outlined and the artist begins constructing the mandala from the centre to outward. The coloured sand is applied through a metal funnel." Attendees to the festival were also offered a rare glimpse into the ancient Himalayan Buddhist art of butter sculpturing, which dates back to the 15th century. Intricate: A visitor takes a close-up shot of the butter sculpture. Using coloured butter, Lamas skillfully create different shapes of flowers, trees and animals into a sculpture, with the image of Buddha focused in the middle. Monk Tseving said: "Butter sculptures are made for offerings to enlightened beings with an eatable substance in decorative form to bring peace, prosperity and good luck to individual and society." After watching the performances, Indian Ambassador to Viet Nam Preeti Sara said: "Nothing short of divine inspiration and blessing could have made this possible." "The activities celebrate our cultural, spiritual, historical and civil linkages with Viet Nam," Sara told a packed audience. "We hope the monks' visit will lead to greater exchanges among our monasteries, for spiritual discourse and exchange of ideas to propagate the teachings of Lord Buddha, for peace, prosperity and harmony in the universe," said Sara. The event marks the first visit to Viet Nam by the Indian Lamas, who attended the Buddhist festivals at the Pho Quang and Vinh Nghiem pagodas in HCM City, from March 5-10. The group also visited pagodas in Vinh Phuc and Quang Ninh province and Hai Phong City, conducting daily ritual meditation, Lama chants and sacred dancing, which were also performed yesterday. Vietnamese audience members were wowed by the spectacular performances, with the monks donning colourful masks and embroidered clothes. Associated with Mahayana sects of Buddhism, the dance is an important part of the Buddhist Festival. Accompanied by music played by monks using traditional instruments, the sacred dance is a form of meditation that is said to benefit those around it. The accompanying sacred chanting is meant to prepare the mind for meditation. "All these activities, which have been handed down from many generations in the Himalaya region are mainly for purification, the dispelling of outer and inner obstacles and to bring harmony, peace and good luck to the individual as well as to society," explained Venerable Jambey Dorjee who leads the delegation.